If you have sash window repair, decoration, or draught proofing in Chelsea or Fulham then this example is close by and easily accessible for site inspection. In this Chelsea sash window case study the windows were draughty, generally in pretty good structural condition, although needed a few minor repairs, and the windows were decorated with new furniture installed. This made the property safer as well as ensured all insurance requirements were met if the unfortunate ever did happen. This article doesn’t carry any information about double glazing. However we do provide this service and if you’d like to find out about it then please follow the window double glazing page highlighted. You can have the original sash windows double glazed, or if the sash aren’t deep enough, we can manufacture new sashes, making use of the original frame. We also supply full double glazed replacement upon client request. 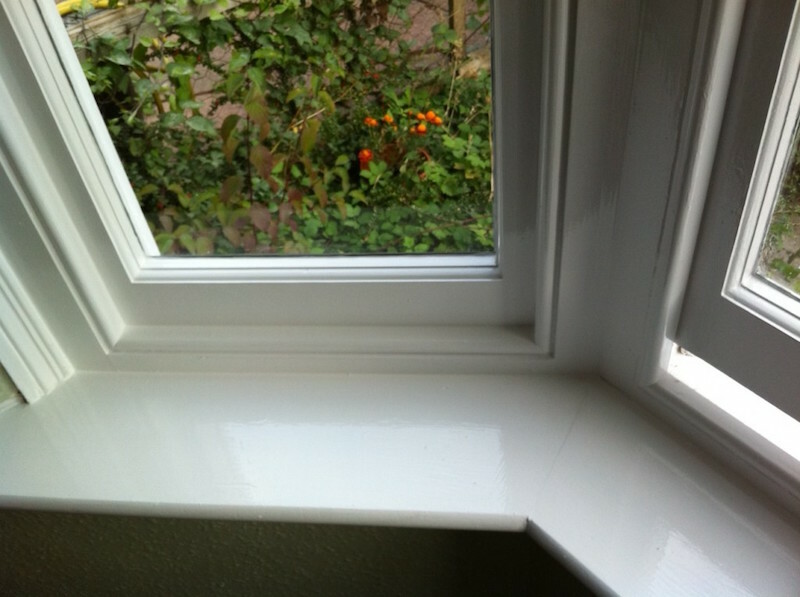 Chelsea and Fulham: Sash window draught proofing, sash window repair, and decoration order of works. The order for carrying out this job is as long winded and complete as it get’s, mainly because the decoration considerably increases the number of processes. We begin every job the same, laying dust sheets properly and as covering as much of your property as we can to ensure the clean up after is limited. Once the basics are covered we mark up the sashes in advance so we know what’s needed when we machine in the mobile workshop and then remove the sashes from the frame. This doesn’t take long. A whole house of 15 to 20 windows are removed in a few hours with a team of three carpenters. With all sashes removed we will then remove cords and old furniture. Then once the furniture is completely removed we will machine all sashes and make grooves for the draught proofing system that will be installed after the sashes are undercoated. It’s good to note at this point that the draught proofing system is completely rebated and hidden from view. 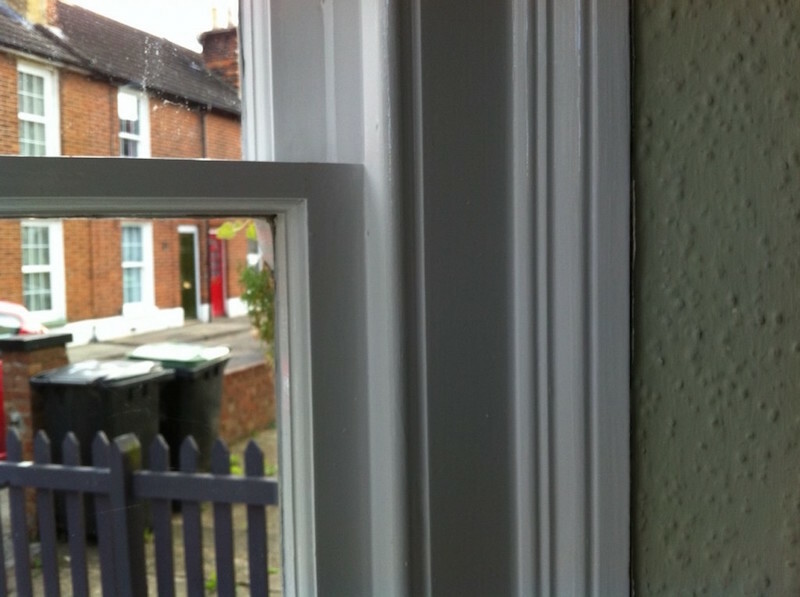 If you’d like to learn more about the sash window draught proofing process then please follow the link provided. You’ll find diagrams and detailed explanations on the linked page. With the sash removed the frames now have easy access. We will make good any repairs. 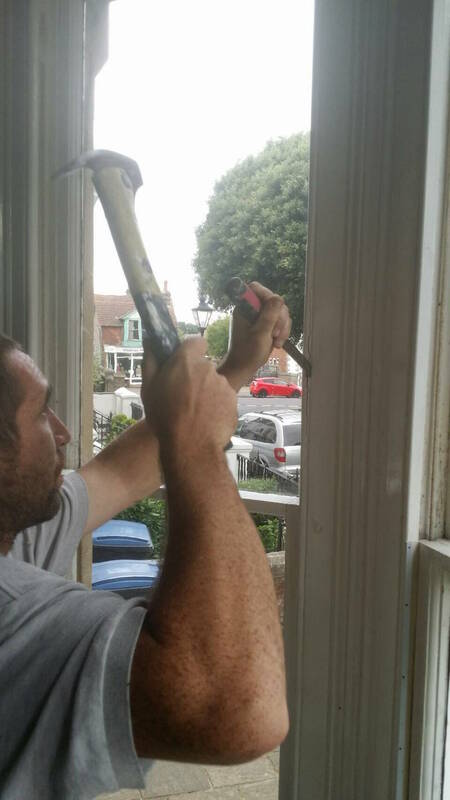 On this particular job there wasn’t any significant sash window repairs, but if you follow the sash window repair page highlighted then you’ll be able to see some very detailed examples of sash window repairs, bottom rail replacements and sill replacements. The sashes can be in pretty poor condition before we would consider replacement as a viable option. 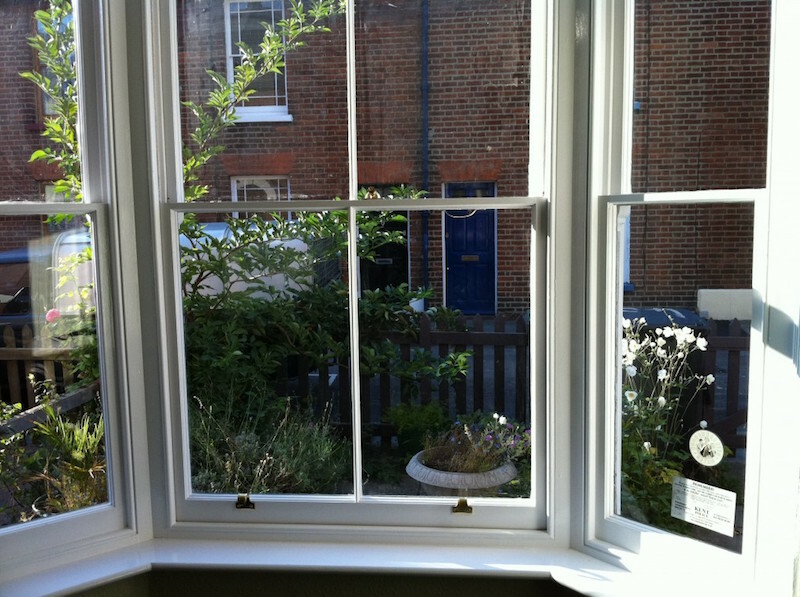 Our aim is to repair and restore as many sash windows as possible. Whilst the frames are exposed it’s the correct time to install new sash cords. Chelsea and Fulham: Sash window painting and decoration. With the sashes machined and all sash window repairs effected, we begin the process of rubbing down frames and sashes. We will do as much prep work as we can in the mobile workshop, but the frames are obviously prepped in situ as they are not removable. This is why we dust sheet as heavily as possible. It’s worth taking a look at our useful installation information to see what we can do together to ensure the installation runs as smoothly, and cleanly as possible. With the sashes rubbed back we will then begin the process of filling to remove any serious blemishes. It should be noted that when we are finished your windows will not look brand new. They will look neat and tidy. Paintwork will be cut in nicely to the glass and the finish overall will look very pleasant. If you head up close with a magnifying glass it will not look perfect. There will not be any sash window decoration specialist in the land who can make your original sash windows look new but they can look very nice. Please take a look at the image provided below. It’s also poor value to do more than our basic service. For example stripping the sashes will just remove paint that has protected them for years. It won’t significantly improve the finish, it’ll provide diminishing returns to do anymore than the basic service which is noted in this article, and I will say 95% of clients are more than happy with it. If you’re in any doubt then we will send you to take a look at some of the work we do recently nearby you, that way you can be sure of what you buy. So back to the write up. Once filling is complete all repairs, re-puttying, and the sashes have been dusted down, and glass cleaned up. We will then prime any exposed timber, repairs, and resin. Once this has set we will begin the process of undercoating all sashes and frames. Please note the sashes will be fixed shut overnight. They will be secure but it’ll be draughty. this unfortunately can’t be helped because even if you’d like to have windows attached, and we would be glad to do so, the paint will smudge. The sash and frames need a night to set first. With the sashes undercoated and the paint cured. We will now rebuild the sashes and add the draught proofing system. The top sash is hung, the parting bead installed, and then the lower sash attached. Staff bead is fixed in place and the joints are all sealed using decorators caulk. With the sashes built and the draught proofing in place we will then begin the process of glossing all sashes and frames. We will then clean up the glass and add catches and security restrictors. The frames are then lubricated and the decoration should be good for many years to come. We always use high quality paint and draught proofing materials. It’s not uncommon for decoration to last 5 or 6 years, with the draught proofing system over ten years. If you live in Chelsea or Fulham then we would be grateful for your phone call today. Please do not hesitate to contact us.